It is, for some reason, extraordinarily difficult for me to explain my feelings concerning this novel. Son of the Shadows is, as all the reviews proclaim, a worthy follow-up to Daughter of the Forest. In fact, both novels are so vastly different that it is practically impossible to compare them and, without a doubt, Son of the Shadows is a beautifully written story, just as heart-breaking and emotionally impactful as its predecessor. Yet, my feelings of awe for this piece are mixed in with guilty disappointment. I say guilty merely because the majority of my friends have found this to be as remarkable a story as the first, and I definitely thought the first was a better novel, and disappointing because I went into this novel expecting it to be just as good, if not better, than its predecessor, and it wasn’t. Nevertheless, I will attempt to push aside my jumbled feelings and convey that, despite what I may have felt, this novel really was a masterpiece in and of itself. 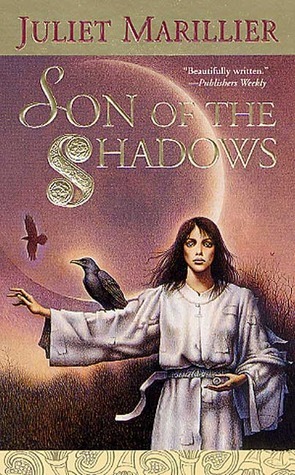 Son of the Shadows chronicles the story of Liadan, Sorcha’s daughter. It introduces us to Niamh, Sorcha’s eldest daughter, Sean, Sorcha’s only son and twin of Liadan, and Liadan herself who happens to be a seer. In Sevenwaters, Liadan’s life has been one of happiness and she, more than her siblings, has received the perfect mix of both her parents’ best qualities. Yet, disaster strikes Sevenwaters when, firstly, Sorcha falls ill and slowly begins her descent to death and later when Niamh is found to be having an affair with a man she is forbidden to be with. As such, Niamh is sent away for a profitable arranged marriage, accompanied by her sister, Liadan. On her way home, Liadan is kidnapped by the troop of the Painted Man, a notorious bandit who wants Liadan to cure his blacksmith. It is here that Liadan’s tale truly begins. What I loved about Son of the Shadows was the fact that, in many ways, it was the opposite of Daughter of the Forest. While Daughter of the Forest is a slow journey of trust, with every step taken one that is a little closer to happiness, Son of the Shadows is the unraveling of that trust and the plunge into darkness. Its themes, different from that of its predecessor, explore the true test of faith, of the multiple sides to every action, and of the importance of recognizing that one person’s happiness or correct path does not necessarily ensure happiness for another. It weaves a complex web of belief in others, one that is very fragile and easily broken, and the steady journey to see where each character winds up in the end and if they can survive and mend relationships despite hurdles is an interesting one to watch unfold. In addition to the themes itself, Son of the Shadows contains a very different kind of romance. In this, Liadan swiftly falls in love with one man, and he falls in love with her too, but the moment he finds out that she is from Sevenwaters, he instantly shuns her and refuses to have anything to do with her due to a past mistake of her father. As readers of Daughter of the Forest, it is impossible to understand why Bran, the Painted Man who falls in love with Liadan, could possibly hate Red and their love story, instead of being one in which the reader is waiting to see if the two characters truly love each other, is one where the reader is waiting to see if the two finally wind up together. I’ll admit that the nascence of this romance moved a little too quickly for me and I wasn’t able to form a solid bond with these two as a couple, but as the story wore on, they won me over and I can frankly admit that their love story is just as beautiful, moving, and powerful as that of Sorcha and Red. Furthermore, Bran is easily my favorite character in the tale, proving to be far more complex and tortured than I imagined and the build-up and eventual truth of his past definitely does not disappoint in the least. Nevertheless, despite its positives, Son of the Shadows certainly had a slew of negative aspects as well. Firstly, I have to state that Liadan experienced little to no character growth at all. When we first meet her, she is already an extremely well-developed character, but it is disappointing to see that her personality doesn’t experience much change despite the events she goes through. Instead, her siblings, Niamh and Sean, are much more flawed and humanely realistic than Liadan is, going through far more drastic stages of growth than she does. Yet, despite this, they don’t feature into enough of the storyline, making Liadan the sibling to love, and furthermore, they lack the strong bond between siblings that is so palpably felt between Sorcha and her brothers. In addition, some parts of this novel almost felt forced, most noticeably the drama. As a novel, it started and ended very strongly, but the middle, opposed to lagging, simply lacked something that left me rather detached from the tale overall. Where Daughter of the Forest made me feel like I was Sorcha herself and made me sob and weep and laugh and smile so much my face hurt, I was so consciously aware of reading a book while reading this. At times, Liadan's journey was just as powerful as her mother's, but during other times, it was simply a very good story. Overall, however, I can’t recommend this novel enough. Sure, it has its flaws, but the ultimate message it leaves you with, the character tales you won’t be able to forget, and the lore that never fails to captivate just cannot be missed. I’ve said it before and I’ll say it again – Juliet Marillier is a remarkable author. For any fan of her novels, this is a definite must-read. It lacks a little something that Daughter of the Forest had, but it is an excellent novel in its own right and it is one that I know I will return to and re-read in a few years, this time without that added expectation, and perhaps I will, after all, find it to be just as good as its predecessor at long last. I think this type of romance is my least favorite, especially if it's a bit angsty on top of it all and I'm pretty sure it must be. I'd always rather go for a 'do they love each other' romance than this. Your super high expectations probably had something to do with the end result, but I love that you loved it overall and I still need to move my suddently not so skinny you know what and read this. Lovely review, Keertana! I agree with you - I liked Daughter of the Forest more than Son of the Shadows. So you're not alone! :) For me, I was most torn that the book was about the next generation (I wanted more Sorcha and Red) and that Sorcha dies in it. It was hard for me to handle that part in particular. Liadan is a wonderful protagonist, but she's no Sorcha. Of course, I haven't read this book in probably ten years, so I am curious to see if my thoughts have changed since then. I do agree with basically everything you said. Unfortuantely for me when I read this as a trilogy, I found each book a little worse (but still quite good overall). But it could have been due to my age, my experiences, whatever. And now there are six books in the series. So there's tons of room for improvement! It's neat to see that this novel is essentially the opposite from the first, that's such an intriguing twist. Usually when an author writes a series, they continue on with the same themes, typically making them darker and adding more depth. However, the change in romance doesn't sound very appealing. Fabulous review as always Keertana! Despite your mixed feelings, I'm glad you were able to enjoy this one so much. =) I absolutely must give this author a try soon! It's often tricky to read a book that was absolutely incredible and hope that the sequel is as good, if not better than the former. I'm sorry this wasn't quite the case with SofS, but I'm still really pleased that this was an excellent follow up though Keertana, and I hope you enjoy the rest of the series and all of Marillier's other books! I'm sure you will. ;) And marvellous review, too! Awww, I'm sorry you were a touch disappointed with this sequel Keertana. I completely understand when you say you feel guilty, that happens all the time when I'm a bit let down by a book I really wanted to love the same or more than the one before it. Still, this is obviously a stunning story as well, even if it doesn't quite meet the bar set by book one. Gorgeous review as always! You know I have heard great things about this series but I wish I could get excited about it.. I liked the way you described this and unraveling of trust and plunge into darkness that does sound intriguing... you know I hate to admit this but perhaps one thing holidng me back is the boring covers??? Pathetic I know especially since I will likely read it on my ereader. I do have a book by this author to review so I will be sampling her work soon! Keertana, you've done such a remarkable job of collecting your very complicated thoughts about this book and putting them down in such an understandable manner. These books are so full of emotion for me that I know how difficult they can be to talk about, even when you have so much to say! I know we already talked at length about most of these things on Goodreads, but I'm still so happy with your reaction to this one, even if it came with issues. I LOVE Bran and his broken complexity, and I also love that, as you said, this novel is about a breaking of trust. It really shows that life goes on after someone's HEA, and how different that can be for everyone involved. Absolutely stunning review! Well I bought the first on your recommendation so hopefully I can read it in the next decade. By your description I might be one who likes this second book nearly as much or as much as the first but I guess we'll see... I do know that feeling of having super high expectations based on other books in the series. It still sounds amazing but I'm sorry it wasn't AS amazing for you. God,here is another fantasy author I really need to start reading! :) Thanks for a lovely review, Keertana! Did you know that you can create short links with AdFly and receive money from every click on your shortened links.